I’ve had the extraordinary opportunity in the past few months, of learning to audio describe theatre performances for visually impaired patrons. The group I work with, here in Vancouver, is Vocal Eye. I had the opportunity to meet with and talk to some of those patrons, who have eloquently told me how much the service means to them, which makes me feel good, but even more so when I hear them laugh out loud in a performance as we are describing it. I also had the wonderfully unique experience, a couple of weeks ago, to be in a performance which was being audio-described: It’s a Wonderful Life, at the Arts Club Theatre. I felt a flutter of real excitement as soon as I stepped on the stage, that night. We had the biggest attendance of visually challenged patrons to that performance of any we’ve had this year. I knew that going in, so was prepared to “do the show for them”, but I almost lost my concentration when I saw the number of Guide Dogs who had also come along. I LOVE dogs, especially service dogs, and it has been a constant challenge to keep my hands behind my back and NOT pet the Guide Dogs while they are working, so to know that there were a whole row of them, all in their holiday best, in the front row was a real challenge for me – especially in a scene where another character and I are gazing out into the night air – and the dogs were directly in my line of vision. I tried not to take it as a comment on my performance when one of them energetically scratched his collar as I was speaking. As usual, the dogs were extremely well behaved throughout the performance (more so, I may say, than some human audience members for whom I have performed) and I would like to dedicate this week’s post to the Guide Dogs and their marvelous human companions, who braved the torrents of rain to come out to the theatre and be part of a fantastic audience. 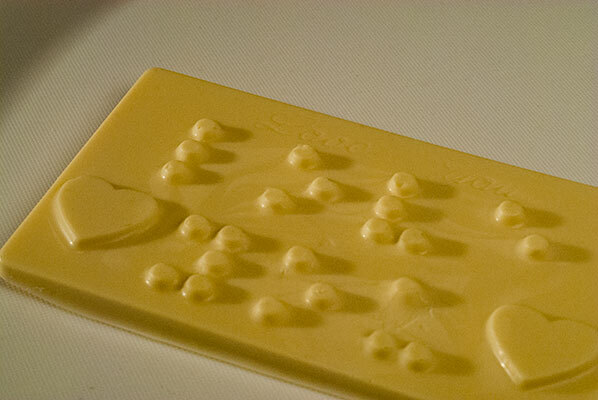 One of our Vocal Eye patrons recently gave me an assortment of chocolate molds of Braille messages/greetings. 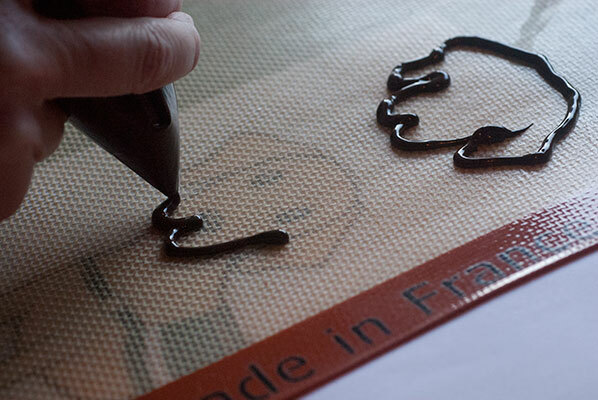 Upon unmolding the chocolate, the message is spelled out on the surface in raised chocolate Braille dots. The surfaces are quite large, and so is the spacing, so I imagine “reading” one of these, would be akin to watching the crawl on a screen. 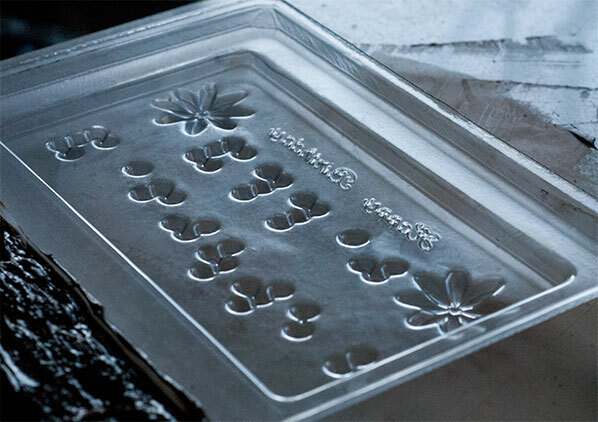 I was eager to try the molds out. It occurred to me that, as the warmth of fingers brushing the surface of the chocolate could melt it, I would need to have the chocolate in perfect temper. Improperly tempered chocolate tends to be grainy, with a dull uneven surface, and tends to melt on your hands more quickly. Not great, especially if you “read” with your hands. And the words “Chocolate Lab” kept leaping to mind. 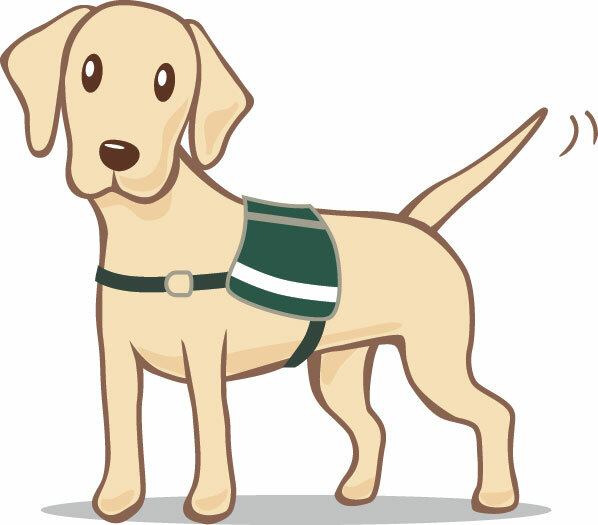 Many of the Guide Dogs are Labrador Retrievers, as their hard working, desire-to-please temperament is ideally suited to the work. I wanted to create something to honour them. At this point, I feel it is very important to state that Chocolate is one of the MOST DANGEROUS things a dog could eat, and under no circumstances should they be given it. No matter how much of a treat it is for us, it is deadly to them. Their metabolisms cannot process theobromine as quickly as we can. Animals that metabolize theobromine (found in chocolate) more slowly, such as dogs, can succumb to theobromine poisoning from as little as 50 grams (1.8 oz) of chocolate for a smaller dog and 400 grams (14.4 oz) for an average-sized dog. The same risk is reported for cats as well, although cats are less likely to ingest sweet food, having no sweet taste receptors. Complications include digestive issues, dehydration, excitability, and a slow heart rate. Later stages of theobromine poisoning include epileptic-like seizures and death. If caught early on, theobromine poisoning is treatable. Although not usual, the effects of theobromine poisoning, as stated, can become fatal. And in general, the darker the chocolate, the more theobromine it contains. Please keep all chocolate away from your furry friends. I did, however, create a litter of Chocolate Labs, for human consumption. A quick search of “chocolate labs” on the internet led me down the path of way too many cute photographs and videos of dogs and puppies, but while I was procrastinating, my partner managed to find this simple, not too detailed, easy to copy even if you have no drawing skills (like me) drawing of a working guide dog. 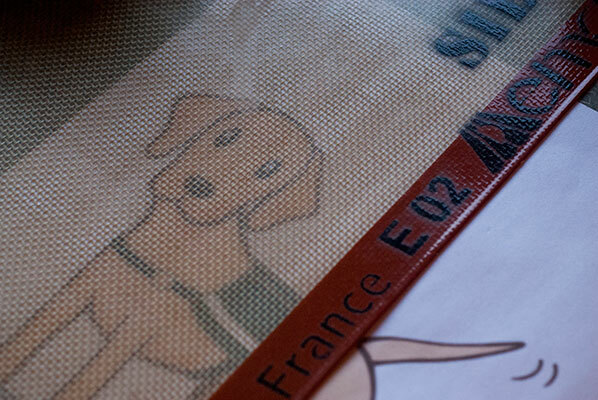 After printing off a decent sized copy, I slid it under my Silpat mat, which worked as handily as tracing paper. I then tempered 600 grams of dark chocolate, poured some of that into the Braille molds, and the rest into a Zip-lok freezer bag. I snipped a tiny hole in one corner, took a deep breath, and piped the outline of the dog’s head. Hmm, surprisingly, not too bad. 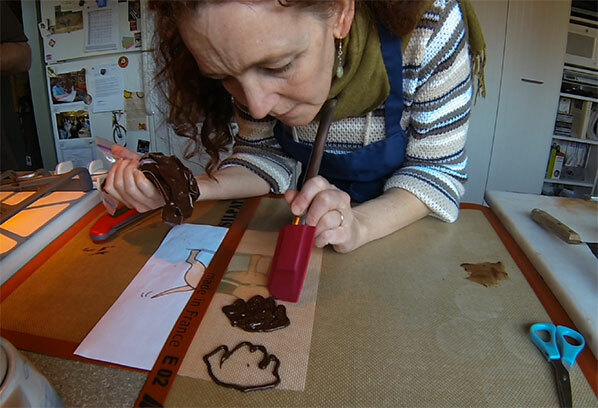 I filled in the outline with a back and forth motion of the piping bag, and suddenly my Chocolate Lab turned into a Labradoodle! 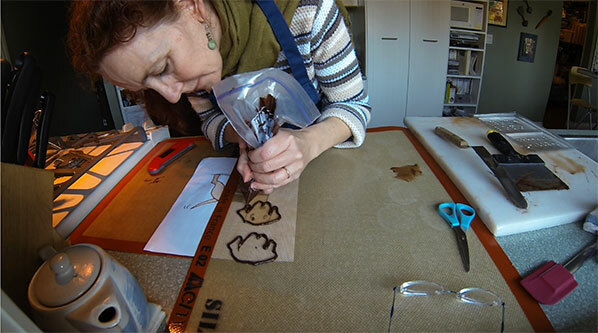 The chocolate came out of the piping bag in a swirl, as I could NOT get the pressure exactly correct for a smooth stream while tracing the outline. I moved the paper template down to a clear spot and outlined the second head. I attempted to fill this one in by placing the piping bag in the centre of the outlined head and applying gentle steady pressure, but this just wouldn’t work in the corners, so I resorted to the back and forth method of the first one. Labradoodle, again. I was concerned about keeping the chocolate in temper, and of good viscosity, so it would actually flow out of the piping bag … but not too quickly. 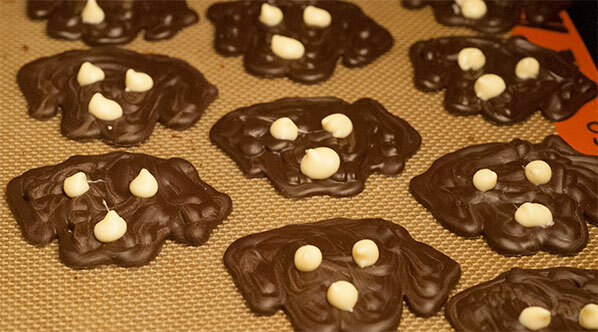 I got my technique of sliding the paper copy under the Silpat mat down to a fine art, and was able to produce sixteen dark chocolate dog heads. 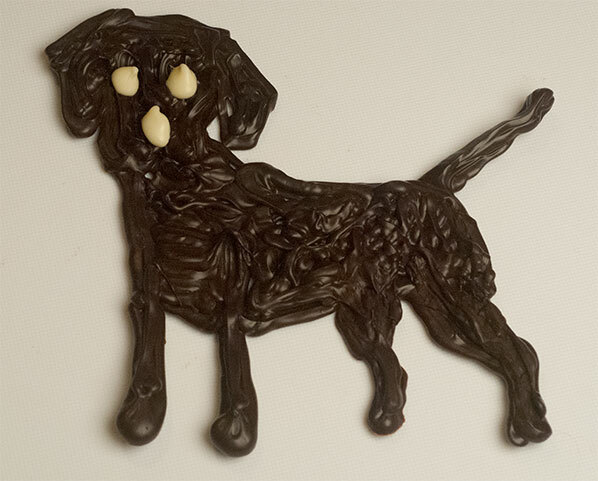 Then I got very ambitious and did one whole dog, with the last of the chocolate. His legs actually turned out well, with good “muscle” definition, and his tail curled slightly off the mat as it dried, making it look as though he is wagging it. I tempered 400 grams of white chocolate, poured most of it into the Braille molds, and piped the rest on to the hardened dark chocolate heads for eyes and nose. I definitely need much more practice in piping chocolate, as can be seen from the photos, especially with fine work like eyes. I tried “painting” the white chocolate on the faces with a toothpick, but this did not really work, and I quickly went back to frantic piping. I think I made the hole in the white chocolate piping bag slightly too big, which partly accounts for the lack of control I had – but I really do need much more practice, as the eyes ended up begin pointed rather than round and soft “melting” doggy eyes. 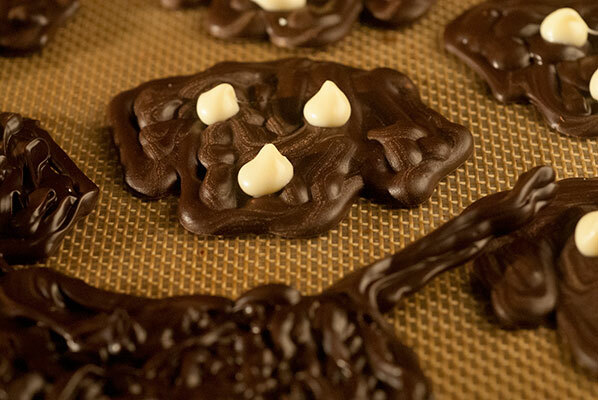 The resulting dog heads are glossy and in temper, and definitely curly-coated. I am quite fond of my Chocolate Labradoodles, and in a further search of the history of Guide Dogs, I discovered that members of this breed are, in fact, often trained as Guide Dogs in other countries. And if you happen to live in Australia, you can pick up one of Guide Dogs Australia’s Puppy Pals, which combines the two techniques I tried today – chocolate dogs and Braille. And now I am off to watch Guide Dog training videos and enjoy one of my chocolate Labs.